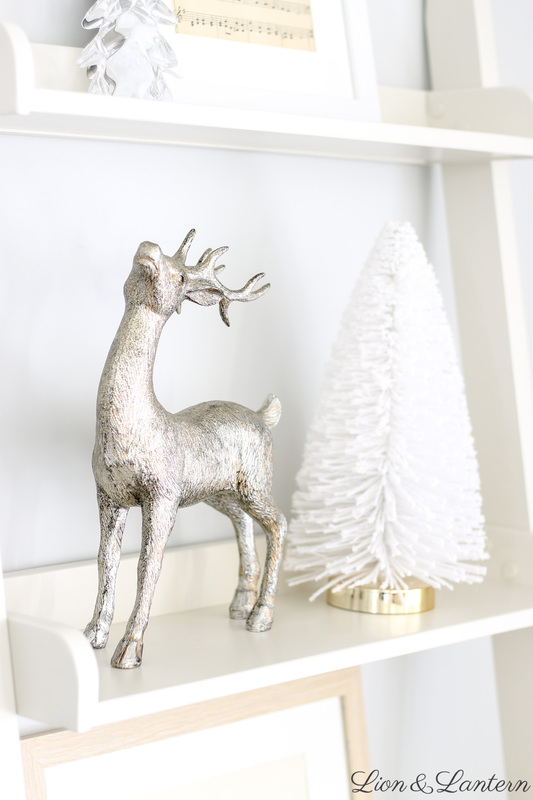 Decorate simply this season with modern, metallic Christmas tree decor. 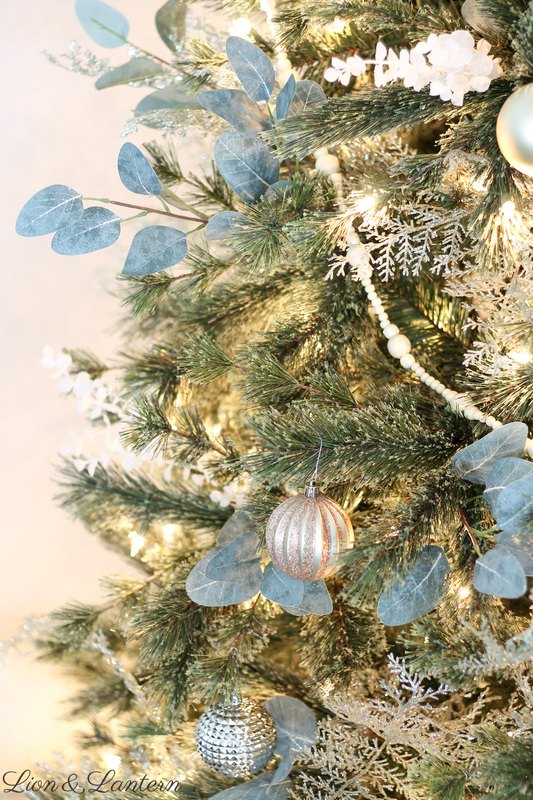 Eucalyptus, glitter branches, wooden beads and metallic ornaments adorn this nature-inspired cashmere tree. 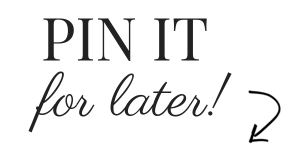 If you’re new to Lion & Lantern, welcome! I’m Caitlin, and I’m so happy to have you today. You can read more about Lion & Lantern here 🙂 I write about cultivating a warm and inviting home, budget decorating, and motherhood. 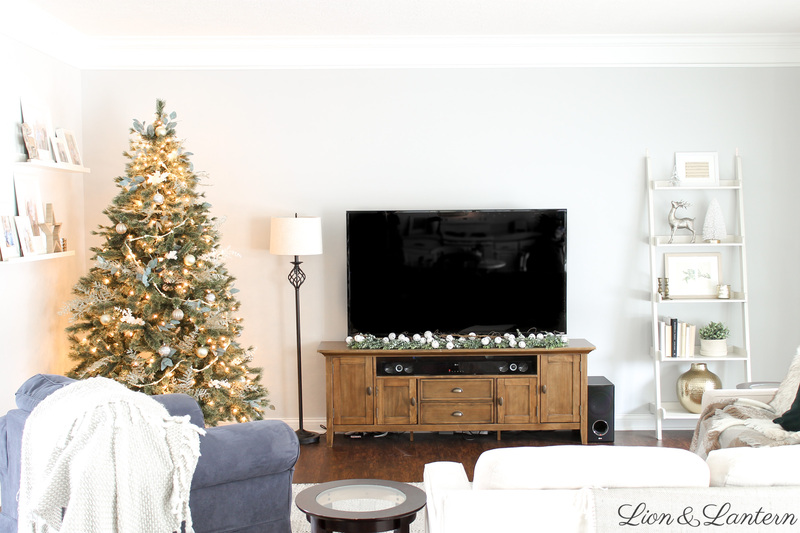 Last week I shared my first holiday post of 2018, our Modern Christmas Living Room. 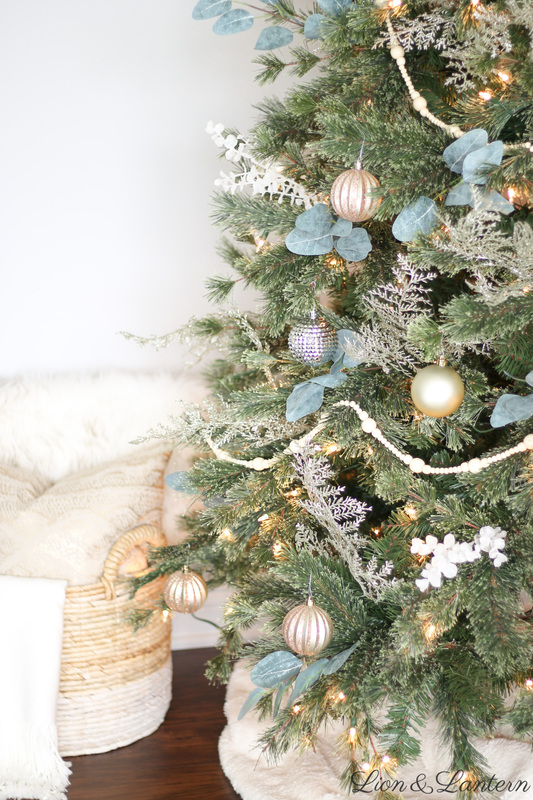 This Christmas season I have been loving simple, minimal decor that doesn’t break the bank. 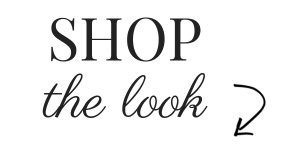 Actually, I’ve only purchased a few new pieces this year, and they have all been items I will use beyond the merry months. 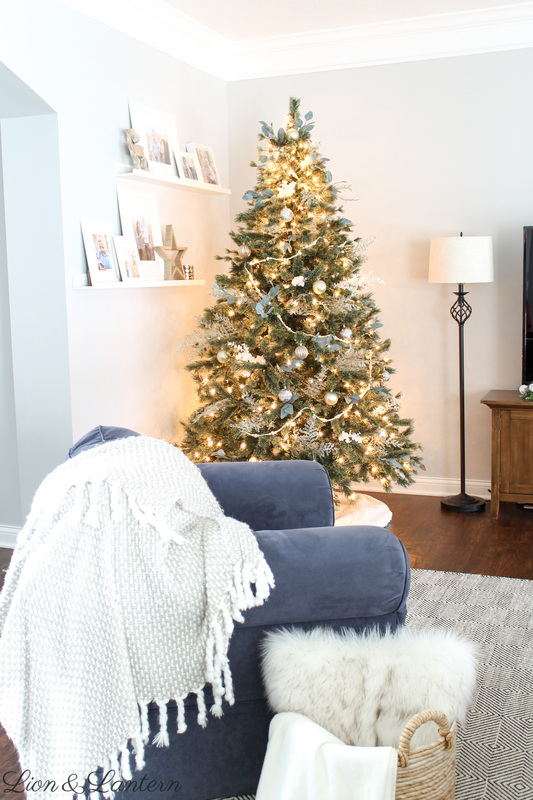 For a closer look at the rest of our living room adorned for Christmas, click here! 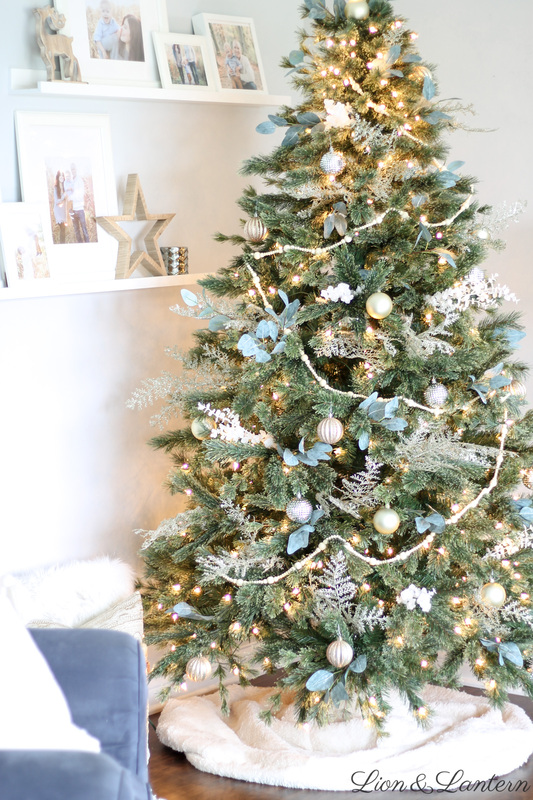 Today I will be sharing our modern, metallic Christmas tree. If you take a glimpse at our Christmas tree from last year, you will notice that I used almost all of the same ornaments! The big difference this year is our purchase of a new artificial tree. 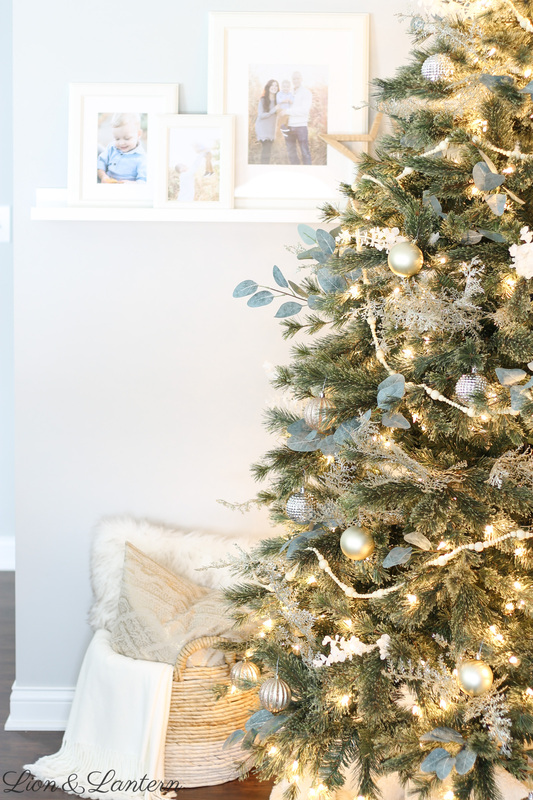 Rather than buy a lot of ornaments to dress our not-so-pretty tree, I decided to put those dollars towards a more realistic and full tree that would mostly speak for itself. 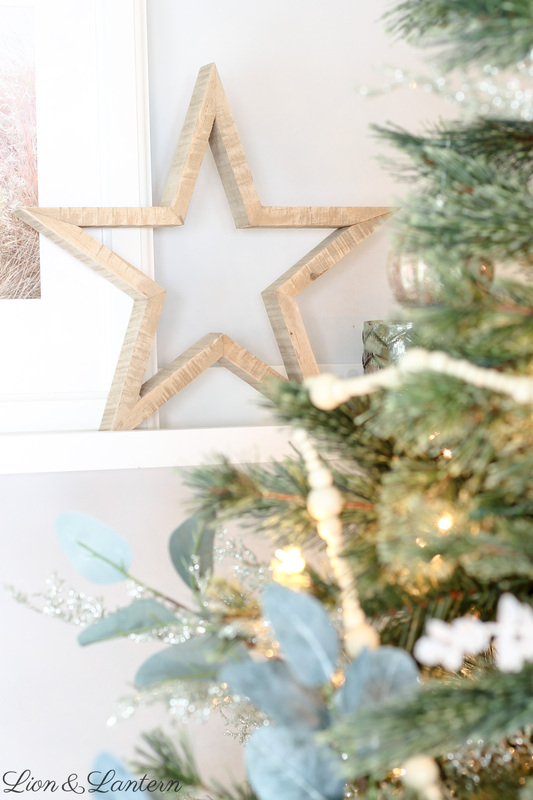 The only other new item I added this year is the gorgeous wood bead garland from the Hearth & Hand line at Target (I wish I snagged two or three, but unfortunately they are sold out right now!). 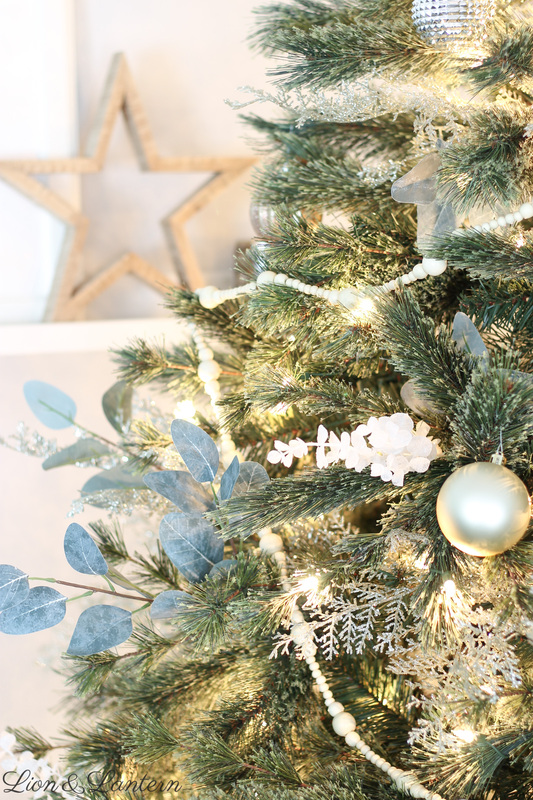 My favorite decor pieces on our tree last year were the faux eucalyptus and glitter branches, so I had to use them again. I love the dimension and interest they add! 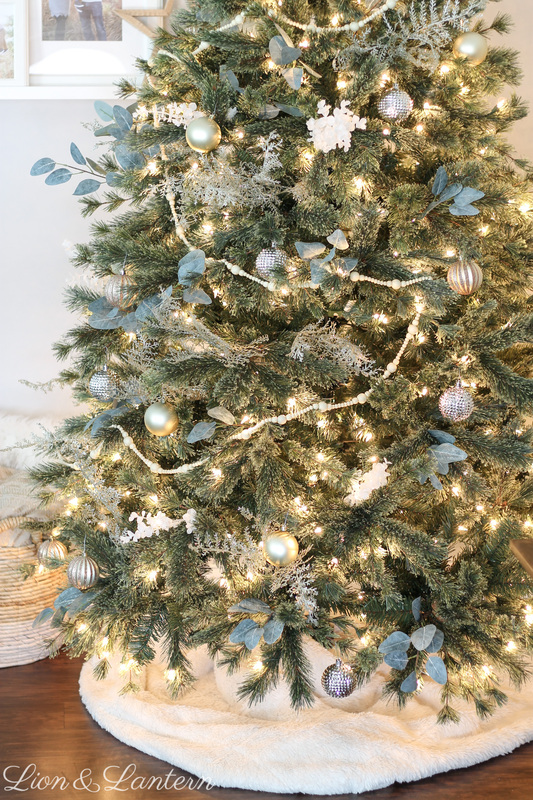 Adding picks or branches also helps fill in any sparse areas on your tree, so they are both pretty and practical 😉 I wove my branches into the light strands on our pre-lit tree to help secure them in place, but you could also use a bit of floral wire if necessary. 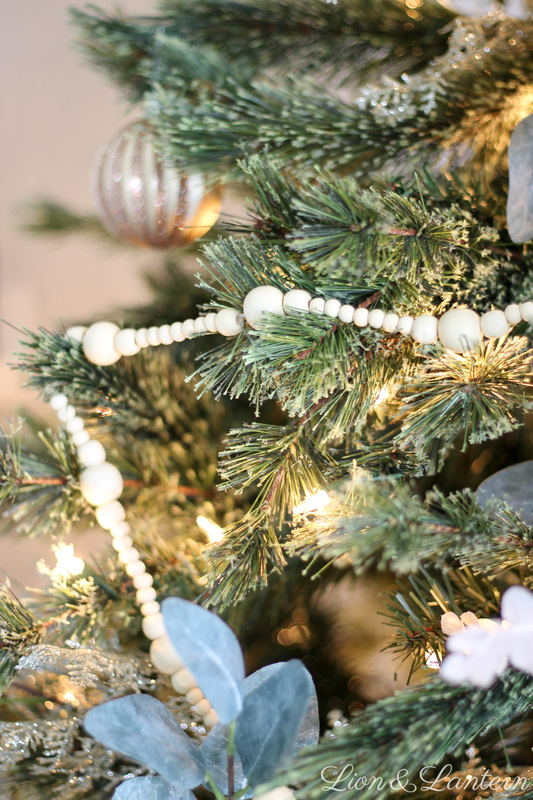 Apart from the wooden bead garland and branches, the only tree decorations I used this year were metallic ornaments. I love the classic look, and they blend well with just about any decor style! 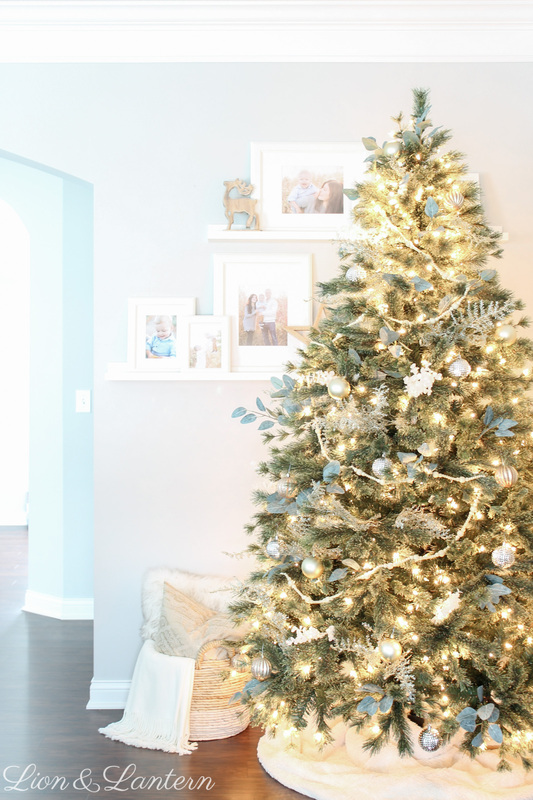 To add interest, select ornaments with varying shapes or textures. Here are a few wider shots of the space! Our living room is a work in progress. I would love the replace the bulky blue chair with two smaller, more modern chairs. And I’m hoping to swap out our lamp and side tables soon. At the same time, thankfulness and enjoying where we are right now is important to me. I do not want to be always wishing for the next thing–the joy is in the journey. 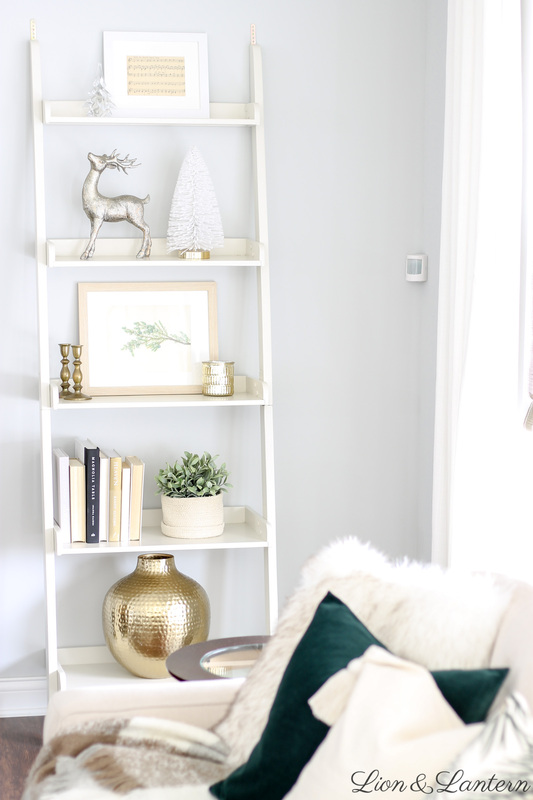 Slowly collecting pieces that reflect our style (and let’s be honest, are practical for life with two kiddos) is a blessing and a fun challenge! Thanks so much for stopping by Lion & Lantern today friends! 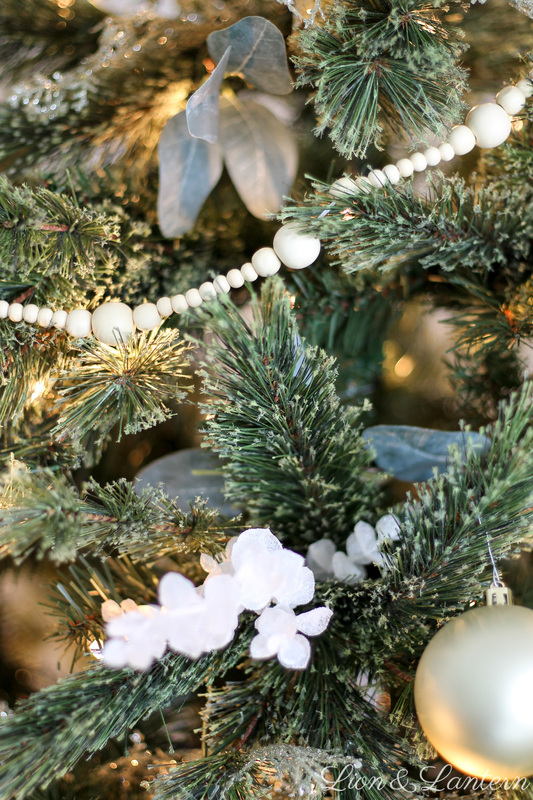 Be sure to check out all of the lovely ladies below, and follow along on our blog hop of Christmas inspiration! Caitlin! This is so beautiful! 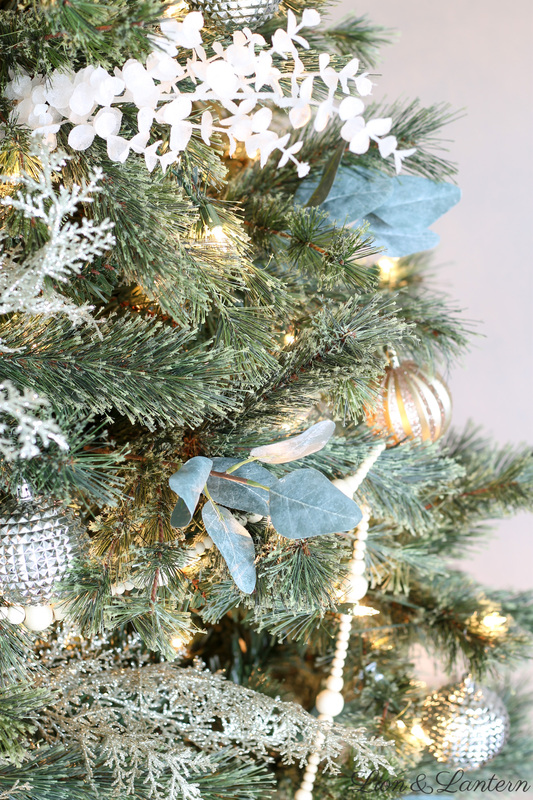 You tree is stunning and I love the sparkle from the sprigs and ornaments! 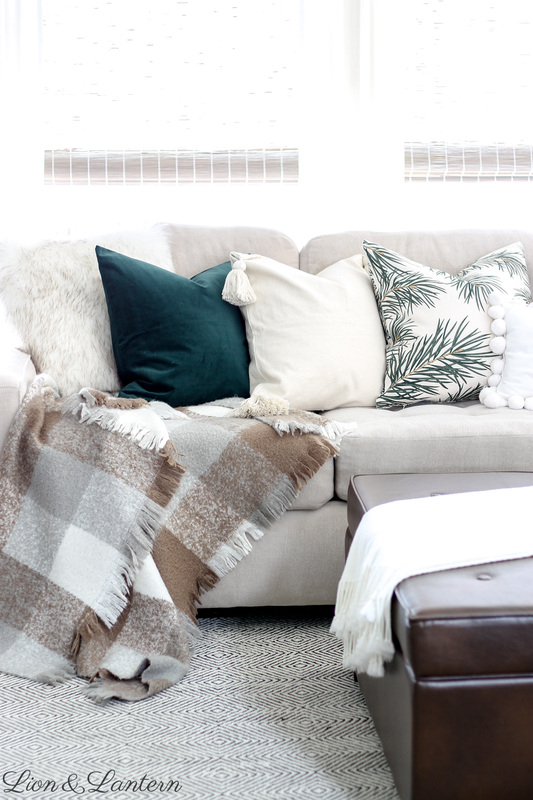 I think my favorite thing is the throw pillows! That emerald color is so rich and cozy! I’m so excited to be joining you on this hop! Love your beautiful tour!! 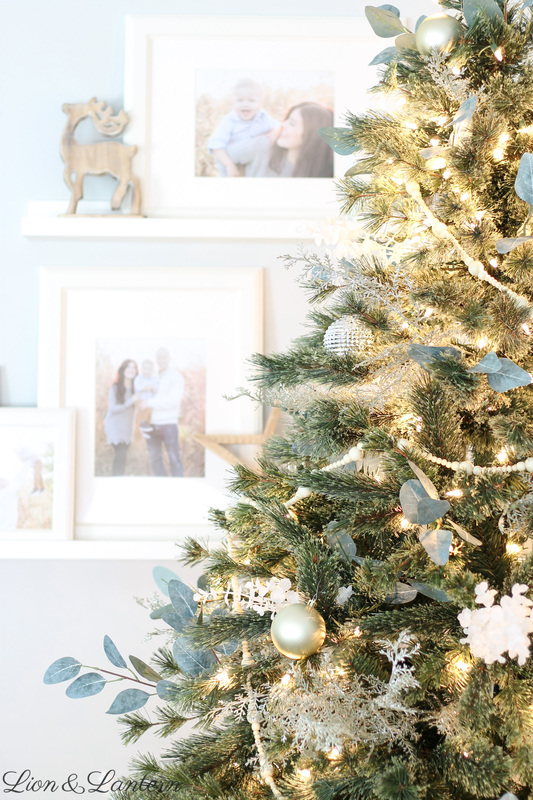 Gorgeous decor and great photography! Caitlin your tree is amazing. I love the eucalyptus you added to your tree. Everything looks so festive and beautiful. 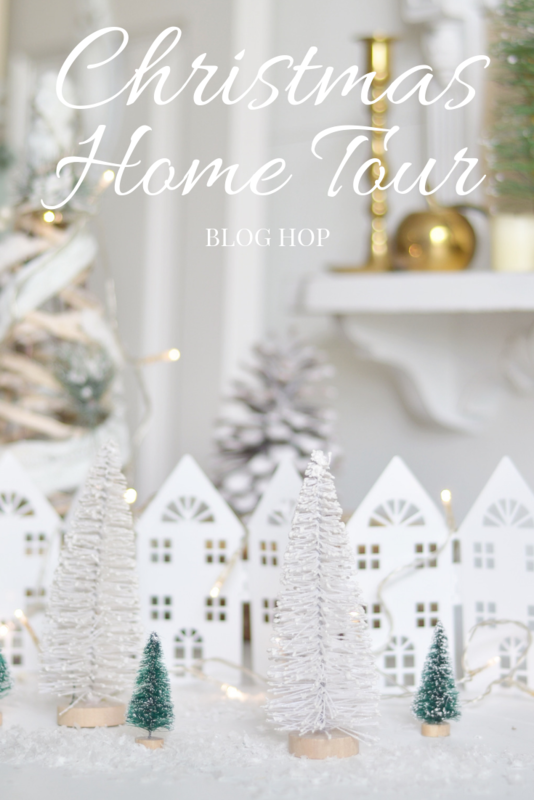 I’m so happy to be joining you on the blog hop! Such a gorgeous tour!! Love the metallics!! 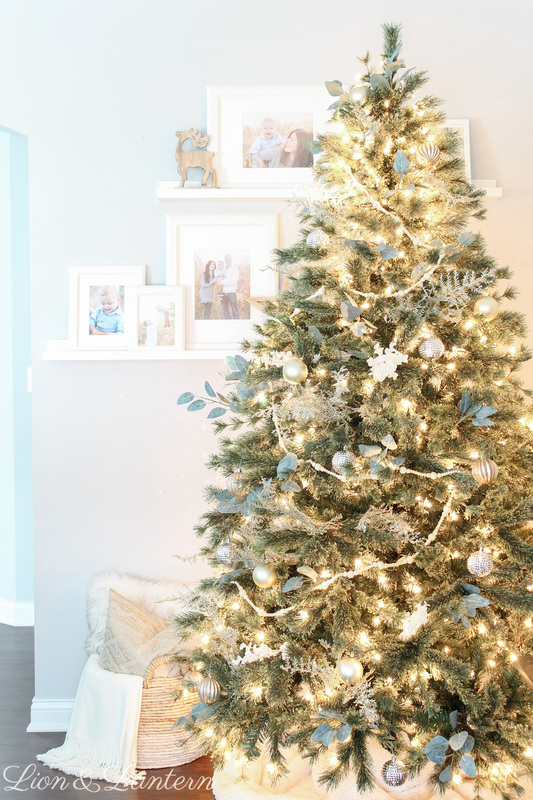 Your tree and living room look beautiful!! And you are amazing at taking photos! 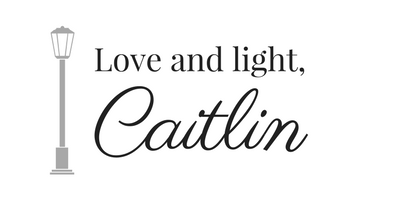 Caitlin! Oh my goodness, I love your tree! And your shelves with the beautiful family photos. Just perfection. I love the leaf sprigs you mixed in. what a great idea! 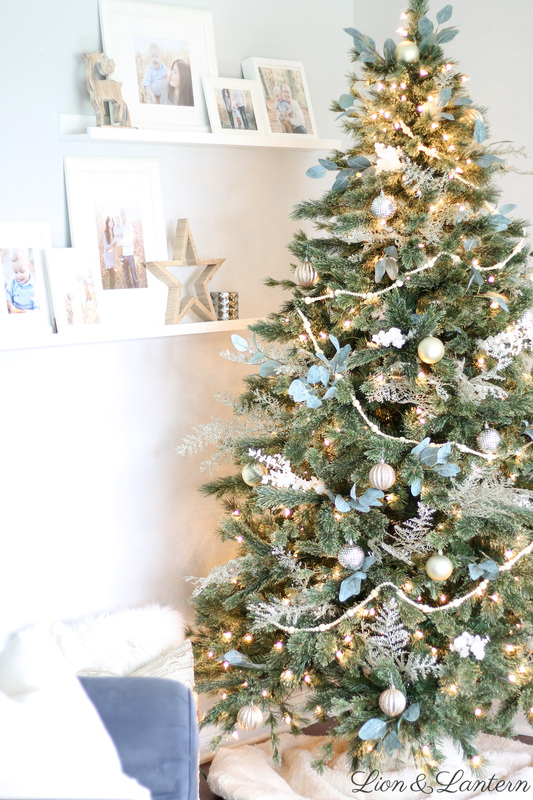 Your tree is lovely, simple and unique! 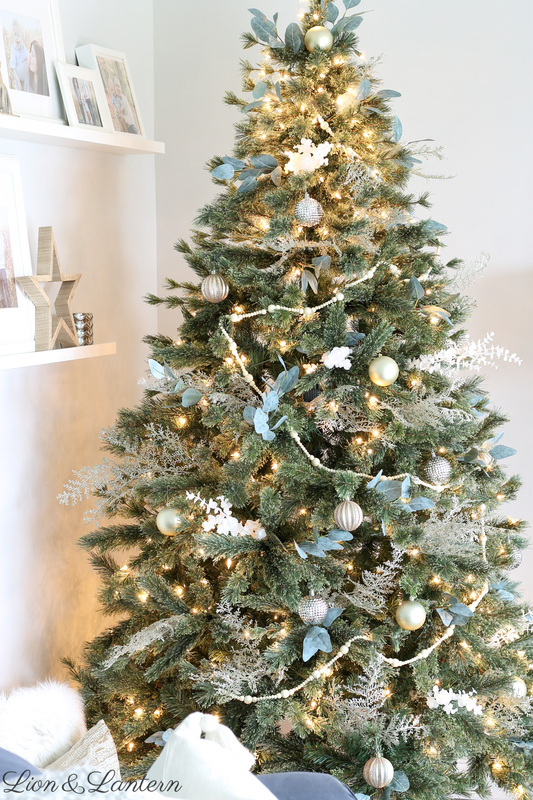 I love that you incorporated the eucalyptus on the tree, such an original idea! Your home looks welcoming and cozy! Merry Christmas! Caitlin what a beautiful Christmas tree!i love the sparkle with a side of eculuptus. 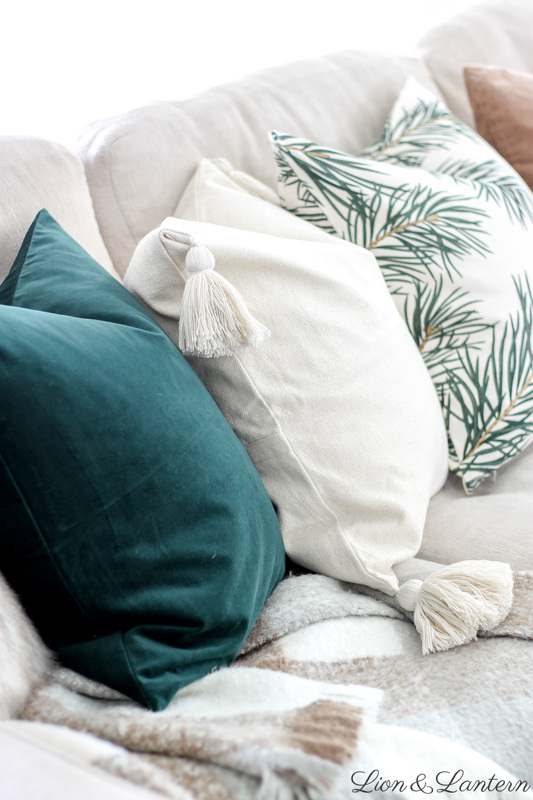 I am also oglling over the adorable throw pillows you have pictured here. What a beautiful room! I bet your family loves it☺️. So happy to meet you here!